Etiquette can be a vague topic. From dining etiquette to workplace etiquette, it’s all about what’s appropriate in what setting. Although we could talk about this all day and then some, we’re going to focus specifically on dining etiquette for this post. This serves as a good lesson for all readers because you never know when you’ll need these skills at a wedding or a corporate event. Today we’ll go over the basic rules for dining etiquette and talk about what you should and shouldn’t do at the dinner table. First and foremost, you should NOT start eating until the host of the event has started eating. If there is no host, wait for everyone at your table to receive their food before you start eating. Putting your napkin in your lap is a great start to the dinner. 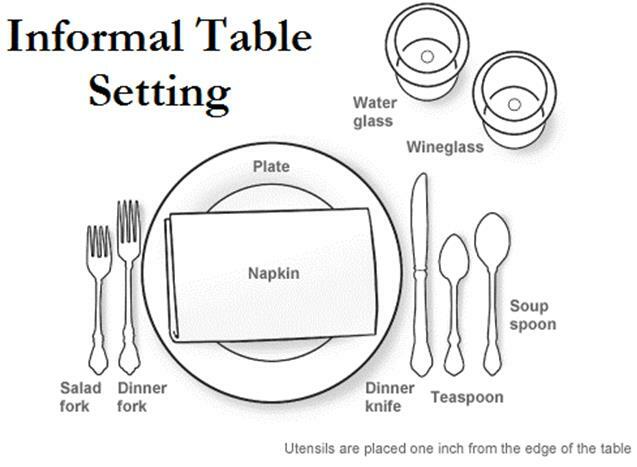 As a general rule, your drink will be to the right of your place setting and you should work your way in if there is more than one fork and spoon. Your salad fork with be the furthest from your plate, your main course will be in the center, and the dessert fork will be closest to your plate. You should refrain from putting your elbows on the table or leaning against the edge of it with your torso. Sitting with good posture with a straight back and relaxed arms will be the easiest way to remember this. Remember to cut your food into bite sized pieces. Nothing is worse than taking a bite that is too much for you to chew! Also, when you put your knife and fork down, rest them on the top half of your plate to ensure the table area stays clean. Break the bread with your hands – also in bite sized portions. You should not take a bite out of your dinner roll. Instead, break off a small section, butter it, and repeat the process. Another helpful hint is that you should never push your plate away when you are finished. Simply wait for the waiter or waitress to come and get it from you. As far as payment goes, leave that to the host of the meal. Do not argue about the bill. Handle it professionally and allow the invitee to pay. Last but not least, ALWAYS be polite. 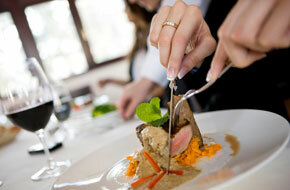 From the host to the waiters, everyone should be treated with the utmost respect while you are attending a meal. There is nothing more impressive than a polite dinner guest and there is nothing more horrible than a rude dinner guest. Mind your manners at all times! The Exceptional Events team hopes that these tips have provided you with the information you need to know to go nail your next formal dinner. The more you know, the more prepared you will be and your comfort will be priceless in an important situation. Enjoy!